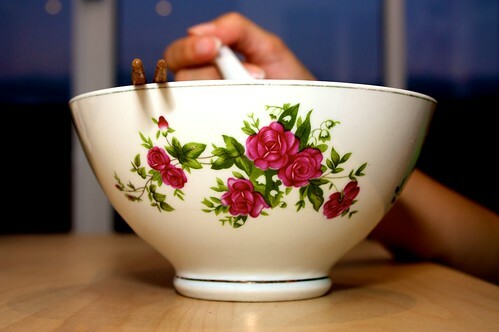 Sometimes people come up with some creative solutions to solve their problems. The correct way to monitor data, such as messages, coming from Telepathy is to write an Observer, however sometimes you just want to get a feed of all of the text messages (e.g. so you can feed it to your keyboard&apos;s LCD or something). The following is a pure D-Bus solution (although it includes telepathy.interfaces to cut down on typing). It listens to all Channel.Type.Text.Received signals, looks up the connection they came from and resolves the sender handle to a name. However note: it makes a lot more D-Bus calls than is required with Telepathy. Really you should cache the results for these handles and listen to the signals that tell you when that information has updated. If you were doing things properly, that&apos;s what you&apos;d do. Like I said, this is not efficient use of Telepathy. If it eats your D-Bus, don&apos;t blame me. On the other hand, this has actually started a conversation about possible new convenience classes for telepathy-python. It used to be that no applications would compile for 64-bit architectures, because everyone was trying to cram pointers into ints. Today I had the opposite. The head of some code I&apos;m working on wouldn&apos;t compile in a 32-bit environment, because someone was trying to store 5 bytes in a long. We have truly come full circle. So Collabora&apos;s robotic and non-robotic overlords very graciously bought everyone on staff an N900 for Christmas. In my opinion, it&apos;s actually a very nice phone (although possibly a little on the large side); but the let down is there just isn&apos;t the same host of applications for it. Still, possessing both the tools and the skills, I figured I should do something about this, rather than complain. 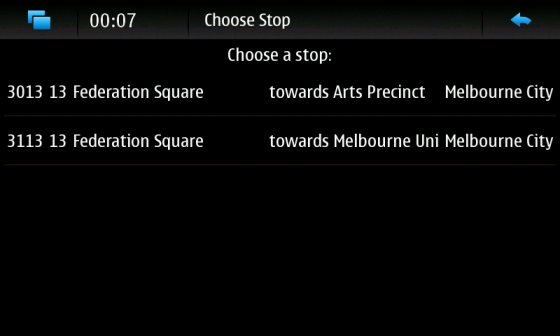 One of the most useful iPhone applications in Melbourne is the real-time tram tracker. 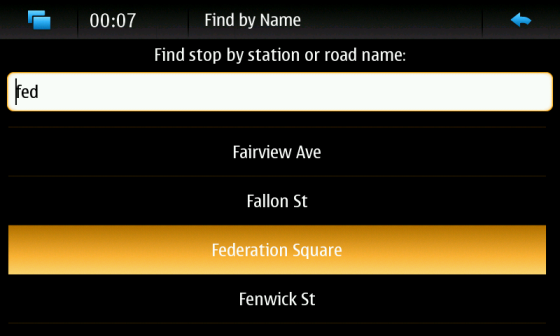 For stops without a display board, you can type in the stop ID and get the upcoming arrivals at that stop. 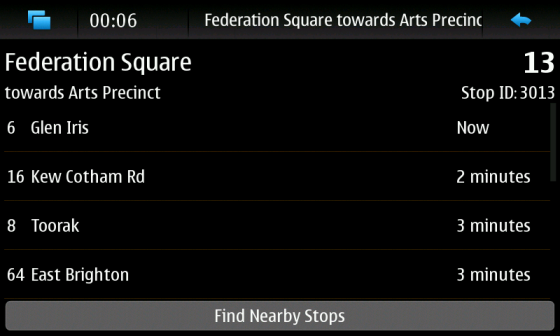 You can also find nearby stops via GPS and a bunch of other things. It turns out that Yarra Trams offer a SOAP WSDL web service that is reasonably well documented, so I&apos;ve spent a few days putting together a basic tram tracker for Maemo 5 (even if only two people will ever use it). 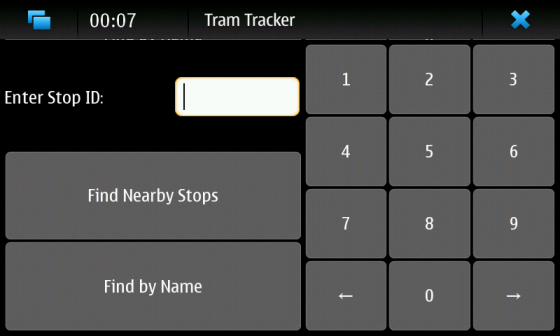 It currently can show upcoming trams for a stop by ID or by searching for stops by road names. Could possibly also do things like search for stop by route. There is a lot of information available. It doesn&apos;t yet do searching by location; the information is in the database, I&apos;ve just not yet looked at how the location APIs work yet. Also need to add support for storing favourites. I also want to add support for tracking a tram by tram ID. I&apos;m wondering if it&apos;s possible to use the GPS to detect periods of immobility and check the upcoming tram stop after the tram starts moving again. I habitually miss stops; so what I think would be neat is to dial in a stop number or cross road you&apos;re looking for, and have your phone notify you when you&apos;re approaching it. The web service uses python-suds, which is unfortunately not packaged for Debian, so I can&apos;t just rebuild it for Maemo (if anyone wants to package this up for me, that would be really awesome). Then I&apos;ll find out how well my app actually runs on the device. In case anyone cares, the source code is here. I&apos;m currently writing a PyGTK client that needs to make network requests using a library that doesn&apos;t integrate with the GLib mainloop (python-suds), so I found myself wanting to be able to make network requests without blocking the mainloop, and getting callbacks in my main thread when operations were done. The pattern to use is clearly having a dedicated network thread. In C I might have used GAsyncQueue, however I&apos;ve found myself quite liking queue.Queue. The following is a fairly generic class for queuing asynchronous requests. Calling the add_request() method from the main thread queues a function to be run in the worker thread. If the callback or error keywords are provided, these will then be called from the GLib mainloop in the main thread (queued via g_idle_add). keyword arguments to receive return from functions or exceptions. to receive notification of readiness.""" What&apos;s really cool though is adding methods to the API that are called asynchronously for you. 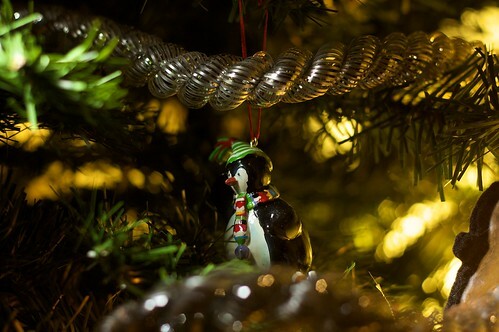 Python makes this possible through the power of decorators. Add the following decorator to a method, and it instead of it being called directly, it will be added to the processing queue. will be queued with add_request. And that&apos;s it! If you can&apos;t follow it, don&apos;t worry too much. This is possibly the most Pythonesque bit of code I&apos;ve ever written, but I&apos;ve tried to make it generic enough that other people can use it for whatever they need. It&apos;s currently part of my app that&apos;s beginning to take shape, but the source is here. Incidently, Maemo people: are there Glade definition files allowing me to use Hildon widgets, GtkBuild and Glade 3? That would be super awesome if there were. I want a widget that is the combination of GtkComboBoxEntry and GtkEntryCompletion that can display a tree of options in a nice, indented way without the expanders (but with the rows expanded). Basically, a search box with a drop-down and hierarchical entries. I think I&apos;m going to have to write my own, thought it sounds like something that might be more widely useful than just my application. Visited nixwilliams and daniel_bethany for a cup of tea, which become lunch (which was delicious) which became more tea, which became waiting out the rain and watching Nicholas Crane trip over a lot. Got wet going home anyway. Now waiting out the rain again before going to the shops. It&apos;s a good thing that I like rain; though mostly I like wearing a giant, warm jumper while it rains outside.